Brilliant Red Dress with Blue Sequined Lattice lace Appliquéd front and four skirt ruffles. It is covered with over 1200 Swarovski Clear crystals of various sizes. Beautiful Red bodice has appliquéd sequined lace and dropped waist. Cape is of the blue sequined lace and cascades from shoulder to waist, shimmering with movement. 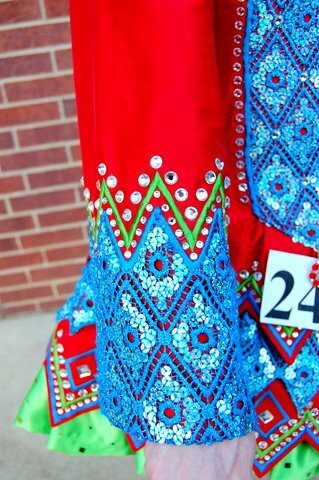 Sleeves continue the red fabric with matching blue lattice sequinned lace design and Crystals. 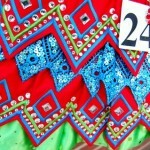 Skirt is embroidered and blue sequined lace ruffles with stiff backing for structure. Beautiful flow with high kicks. Dress has lining with open seams for ease in tailoring (has several inches of let out without leaving marks) and full length zipper. Red Jeweled number holder on left. Currently worn by a 16 year old, 5′ 8″ prelim dancer. 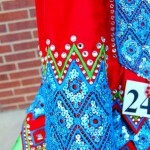 Purchased June 2010 and worn for Oireachtas and Nationals. 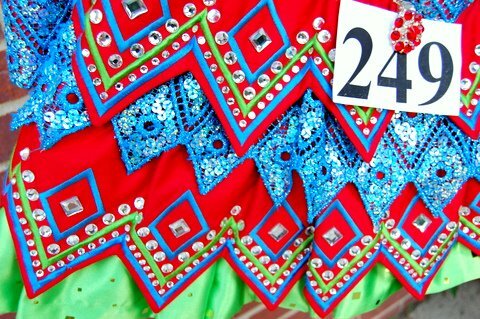 Shimmering sequined lace Cape, Red sequin headband with Swarovski crystals and green bloomers included. Dress is in excellent condition, well cared for, odor free (arm protectors)and from a smoke free home. 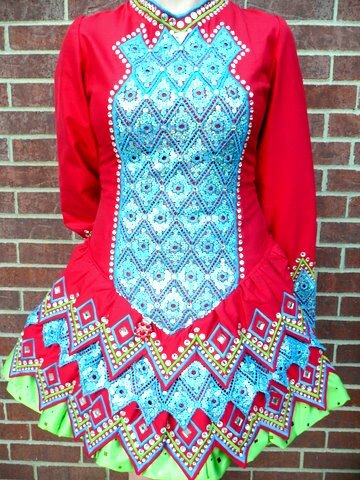 We have received many positive comments on the amazing stage presence of this dress. One of the limited Amy Dengler Design Dresses. One of her recent dresses was on a world qualifier. https://picasaweb.google.com/kinkinjoy/20110929?locked=true – Picasa link for photos. Asking Price: $US997. Shipping included at this price within the USA, only. Will consider 48 hour return option for fit and TC approval if you pay return shipping w insurance and condition is equal. Payment with PayPal or certified check.